Promotional Panoflex data cable is a fast synch, charge cable with 2 in 1 adaptor suitable for Android and Apple Smartphones. Branded Panoflex cable is made to the same quality standard as used by the Army and RAF in frontline fighter jets and attack tanks! 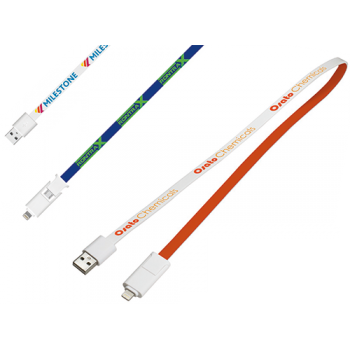 Promotional Panoflex Charger Cable can be printed with your logo and message to both sides using full colour digital print. 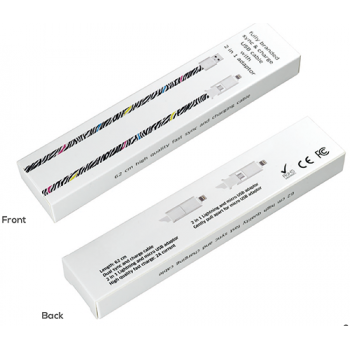 The data cable is white as standard but can be produced in your corporate colour. The cable is a very useful 62cm long. Branded Smartphone Charger is presented in a stylish gift box with a 556 x 8mm print area. 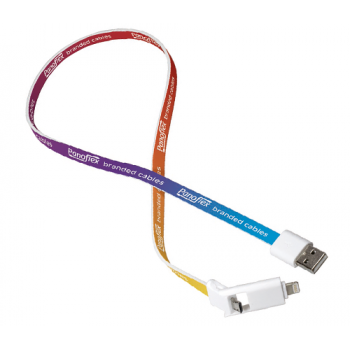 Promotional Smartphone Charger is an ideal giveaway gadget gift at your next Conference or Mailing event. Everyone needs to charge their phone up so it will remain client facing long after the event has finished.